Baronin Hannah Matilde von Rothschild [1832-1924, wife of Baron Wilhelm Carl von Rothschild], Grünberg and Frankfurt am Main; purchased 1930 by (Wildenstein & Co., Inc., Paris, New York, and London); sold 1946 to the Samuel H. Kress Foundation, New York; gift 1946 to NGA. During the preparation of the NGA systematic catalogue of its French paintings of the 15th through the 18th century, Joseph Baillio of Wildenstein & Co. kindly provided the year that the company acquired the painting from the Baronin von Rothschild. Exhibition of French Art 1200-1900, Royal Academy of Arts, London, 1932, no. 257 as Conversation Galante. The Great Tradition of French Painting, Wildenstein & Co., Inc., New York, 1939, no. 14 as Conversation Galante. Recent Additions to the Kress Collection, National Gallery of Art, Washington, D.C., 1946, no. 883. The Rococo Age: French Masterpieces of the 18th Century, The High Museum of Art, Atlanta, 1983, no. 44. 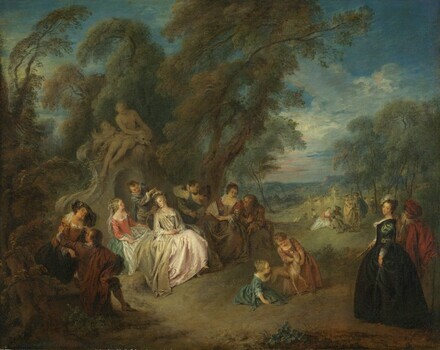 The Age of Watteau, Chardin, and Fragonard: Masterpieces of French Genre Painting, National Gallery of Canada, Ottawa; National Gallery of Art, Washington, D.C.; Altes Museum, Berlin, 2003-2004, not in cat. (shown only in Washington). Shared Treasures: The Legacy of Samuel Kress, Allentown Art Museum, 2011-2012, no catalogue. Frankfurter, Alfred M. Supplement to the Kress Collection in the National Gallery. New York, 1946: 57, repro. Cairns, Huntington, and John Walker, eds., Great Paintings from the National Gallery of Art. New York, 1952: 120, color repro. Paintings and Sculpture from the Samuel H. Kress Collection. National Gallery of Art, Washington, 1959: 351, repro. Walker, John, Guy Emerson, and Charles Seymour. Art Treasures for America: An Anthology of Paintings & Sculpture in the Samuel H. Kress Collection. London, 1961: 180, repro. pl. 170-171. Summary Catalogue of European Paintings and Sculpture. National Gallery of Art, Washington, 1965: 99. European Paintings and Sculpture, Illustrations. National Gallery of Art, Washington, 1968: 88, repro. European Paintings: An Illustrated Summary Catalogue. National Gallery of Art, Washington, 1975: 260, repro. Eisler, Colin. Paintings from the Samuel H. Kress Collection: European Schools Excluding Italian. Oxford, 1977: 306-307, figs. 271, 274, color repro. (detail). Walker, John. National Gallery of Art, Washington. Rev. ed. New York, 1984: 330, no. 441, color repro. European Paintings: An Illustrated Catalogue. National Gallery of Art, Washington, 1985: 300, repro. Conisbee, Philip, et al. French Paintings of the Fifteenth through the Eighteenth Century. The Collections of the National Gallery of Art Systematic Catalogue. Washington, D.C., 2009: no. 78, 362-364, color repro.